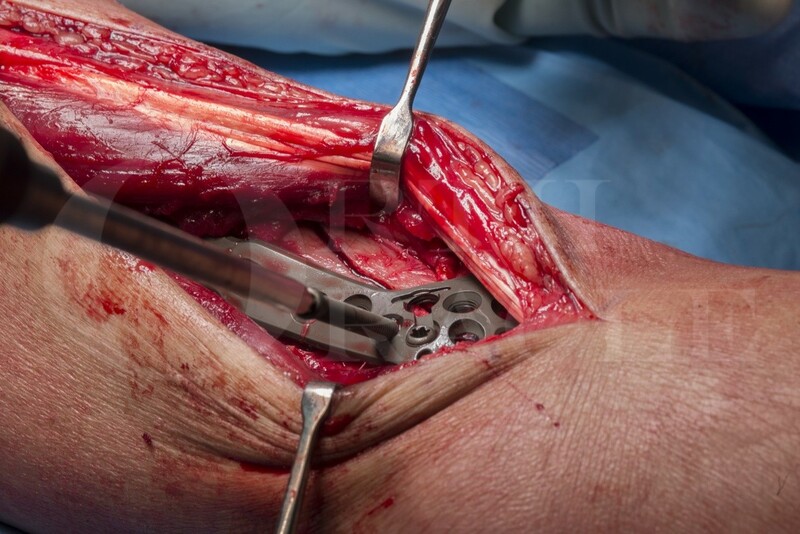 Learn the Internal fixation of distal tibial Pilon fracture using Stryker AxSOS 3Ti plate. surgical technique with step by step instructions on OrthOracle. Our e-learning platform contains high resolution images and a certified CME of the Internal fixation of distal tibial Pilon fracture using Stryker AxSOS 3Ti plate. surgical procedure. Pilon fractures are fractures of the distal tibial plafond and by definition are intra-articular and in a load bearing joint, this renders them serious and often life changing fractures. The fracture is sustained by a mixture of shear and compressive loads to the distal tibial metaphysis. Pilon fractures make up between 5 and 10% of all lower limb fractures and because of the energy involved are associated with a high (15 – 55%) complication rate. Significant rotational force can also cause distal tibial fractures which involve the plafond and these are also pilon fractures. This mechanism though usually has less severe soft tissue damage and less compromise to the articular surface in terms of comminution and cartilage damage. The most frequent mechanism of injury is a fall from height and this case demonstrates this , being sustained after a 4 metre fall onto concrete through a weak roof . The big debate is when to use ORIF or minimally invasive plate osteosynthesis (MIPO), and when to use an external fixation frame (such as an Ilizarov or other fine wire construct) as definitive treatment. In my hands and working in a unit with excellent fine wire fixation skills locally we tend to treat those cases where there is very severe soft tissue damage or where the articular surface is grossly comminuted with a frame. Those cases where the degree of articular comminution is less severe are usually treated with plate fixation as was the case presented here.